Traditionally, people think of hot sauce as a table condiment. And surely enough, K-Sauce is excellent served on the table. 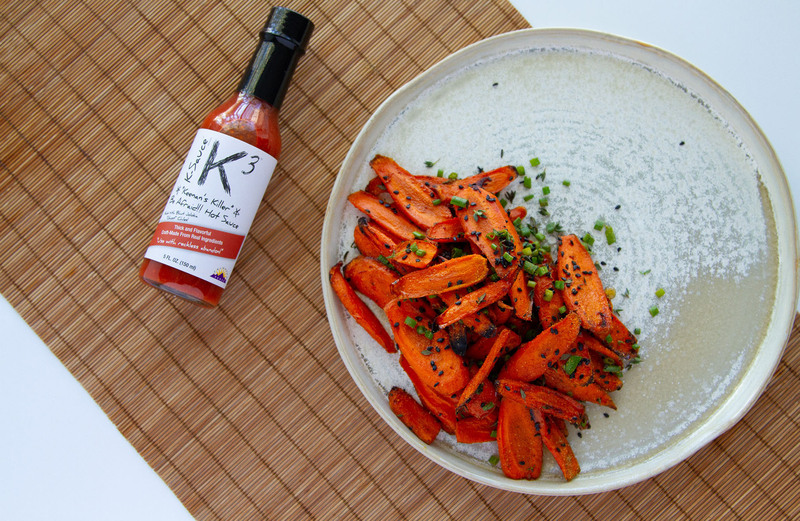 But K-Sauce comes into its own in the kitchen, used as part of your favorite recipes — or, try some of the suggestions we present for you here, in our recipe section. Every recipe you'll find here has been carefully tested in our own kitchen, and you're sure to enjoy many (or hopefully all!) of our delicious choices that cover main dishes, side dishes, dips, dressings and so much more. As always, if you have comments, suggestions or other feedback please Contact Us! We'd love to hear from you about these recipes. Finally, do check back... Our team is constantly coming-up with new ideas and new uses for K-Sauce, and we're excited to share them with you. Our recipes are sorted by the sauce used, but in most cases, you can substitute a different K-Sauce for the one suggested. Occasionally, a specific sauce choice is important, especially with K-4 Sunshine Mango, given its fruity undertones, and K-6 Chipotle, with its unique smokiness. But for the remainder, feel free to experiment. You might find one you enjoy more!